Though a common misconception exists that the mid 19th century was cloaked in dull browns and blacks, the colors used in the Sally Rose Collection illustrate that rich, glowing, brilliant colors were the norm for the mid 19th century. Before the dark era of the economic collapse of the late 1850s and the years of the Civil War, these fabrics would have echoed the cheerful and gay feeling of the day. The fabric selections for Sally Rose were inspired by the grand floral stripe used as the lead in the line. The original stripe was taken from a whole cloth quilt in Eileen's collection. The top of the quilt was made of two lengths of fabric and were an obvious reuse from the skirts of a dress: an illustration of 19th century recycling at its best, saved for us to reproduce! These fabric print styles were prominent in the 1840 to1865 era, with their rich ombre grounds, floral elements, and linear influences. Fabrics with strong linear patterns were popular throughout the mid 19th century, and were commonly used for women's dresses. Stripes were selectively cut to create optical illusions in quilt and dress constructions, to trim curtains and border quilts, and to enhance other handwork objects. 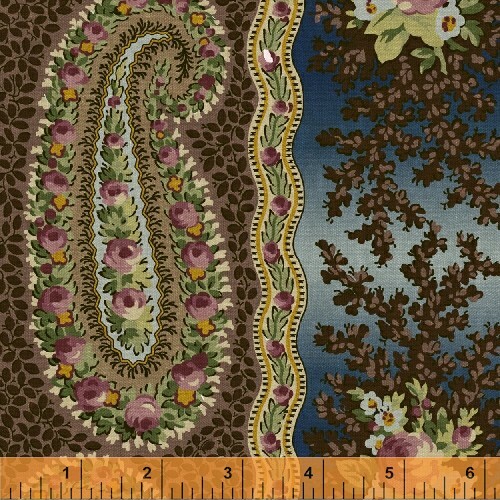 The companion fabrics in Sally Rose were selected from a large 9 patch quilt and several quilt blocks from the 1840 through 1865 period which also exist in Eileen's personal collection. Fabrics selected were chosen for their elegant, timeless appeal, and delicate feminine style. They were chosen for their possibilities for the modern day creative quilt maker as well as those who love beautiful traditional things. Some are created designs, based on appropriate colors and styles of the mid 19th century. For example, the lacy serpentine is a created pattern, based on the lace designs of the mid 19th century, and modified from the original lead stripe.